Amaco® Semi-Moist Underglaze Decorating Colors are suitable for many types of ceramic painting. 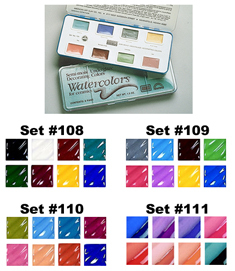 This series contains 24 colors available in convenient semi-moist (watercolor) pan form. Colors are concentrated, intense, and opaque. Additional shades and tints are made by intermixing. Colors may be brushed on either bisque or greenware. A brush dipped in water lifts the color for decorating. Further thinning of the water-soluble colors prepares them for transparent water color effects by brushing. All sets are supplied in hinged-lid plastic boxes. Peach, maroon, pink, rose and yellow fire to cone 6. All others to cone 10. Cara Moczygemba, Indianapolis, IN, used Semi-Moist Underglaze Decorating colors on this tile.